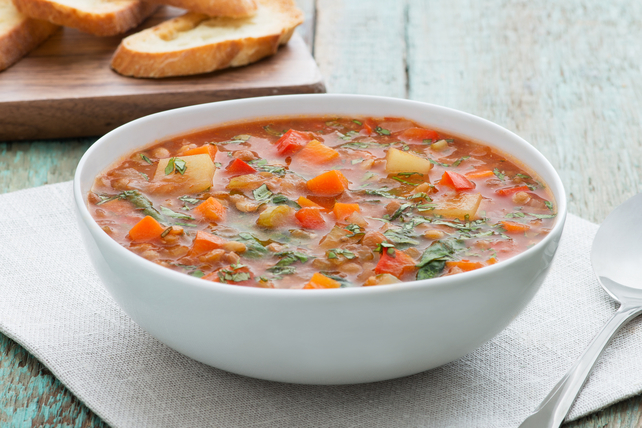 A soup worthy of its name and perfect for when there is a chill in the air. Heat oil in large saucepan on medium heat. Add carrots, celery, onions, peppers and rosemary; mix well. Cook 3 to 5 min. or until vegetables are slightly softened, stirring occasionally. Add broth, lentils, tomato purée and potatoes; stir. Bring to boil; simmer on low heat 25 to 30 min. or until potatoes are tender, stirring occasionally and adding vinaigrette for the last minute. Remove from heat. Stir in spinach and cheese. Substitute canned chickpeas (garbanzo beans) for the lentils. For added heat, serve with hot pepper sauce.